Cheese or not, I wanted to watch Brilliant Legacy for one reason: Bae Soo-bin. Playing a king in last year’s Painter of the Wind, he owns the most soulful eyes I’ve ever seen on a K-drama royalty. I love his eyes and pretty much everything about him. Which, of course, begs the question: Why is Mr. Soulful Eyes looking so glum below? Well, Park Jun-se (Bae Soo-bin) has a car and of course it’s precious to him and he expects to drive it. But a stranger who has just come off a flight from New York wants to take over the steering wheel. A very bad idea, if you ask me, because you shouldn’t drive when you have jet lag! But try telling that to obstinate people. Jun-se’s misgivings are well-founded and we are “treated” (if you consider rolling your eyes repeatedly a treat) to a hair-raising highway race. But let’s backtrack a bit and go back to that New York flight because that’s where we’ll first meet our two leads. Remember “Miracle on the Hudson River”? An airliner lost power in both its engines after it collided with a flock of migratory birds, but the pilot miraculously landed the plane on the river without a single casualty. Apparently birds are a perennial problem in that area. With that backdrop in mind, it’s my theory that a bird somehow managed to get into the plane that’s bringing our leads home to Korea. So, as Sunwoo Hwan (Lee Seung-gi) was sleeping, our displaced bird sought out Hwan’s head and decided to build a nest on it! How else do you explain this hairdo? Hwan’s mane bugs me. In every scene that he’s in, all I see is that… nest. In my case, it’s that… thing. Because of that damned hair I just can’t make myself like Hwan. It’s irrational, I know. Hwan’s grandma has hair that looks like his but I don’t hate her. Speaking of grandma, she’s president of a veritable seolleongtang (beef soup) establishment and it’s her plan to make Hwan her hair. Oops, I mean heir, HEIR! There’s a little problem, though. 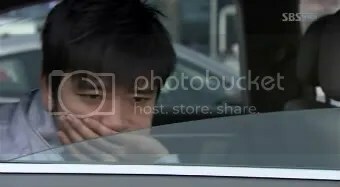 Hwan hates the smell of seolleongtang. He’s also an RJ (royal jerk) who thinks nothing of flinging paper cups out of the car while driving (studying in the States taught you it’s okay to litter? 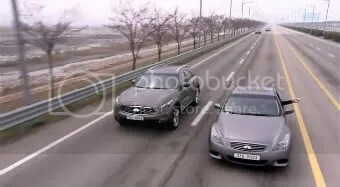 ), never mind that it almost causes an accident. (Hence that car race mentioned earlier.) His family is worried that he has disappeared after landing in Seoul? That’s their problem. He took a fellow passenger’s bag by mistake on the plane? She needs the bag so badly she’s practically in tears pleading with him? Let her wait. A royal jerk’s world revolves around himself. Which makes it puzzling then that Yoo Seung-mi (Moon Chae-won) should be so overjoyed to see Hwan at the airport. Maybe he’s not a royal jerk but royal jelly, soft on the inside with a heart full of goodness? Nah, not in the first two episodes. Everything that he has done thus far makes you want to boil him alive in one of his grandma’s seolleongtang vats, so unlikable and overbearing is he. I don’t know if it’s possible for him to change his stripes in 26 episodes. More like 260? Take this scene, for example. After grandma issues him with various threats, Hwan has no choice but to show up for work at the seolleongtang restaurant. But instead of working what does he do? Throws a royal tantrum and proceeds to show why he’s more brute than gentleman by punching the restaurant’s manager. Fortunately, one person in the drama is not afraid of Hwan. Go Eun-sung (Han Hyo-joo) had the misfortune of sitting in the same row as Hwan on the plane. No thanks to a 14-hour flight and the weight of the nest on his head, obviously-in-a-stupor Hwan mistakes Eun-sung’s bag for his own (how coincidental that it’s exactly the same and how convenient not to check the tags, hullo!). The bag contains a special gift for her father’s birthday and when her persistent efforts to recover the bag from Hwan fail, Eun-sung socks him one, thus allowing us to see his large nostrils and thick lips. Not a pretty sight. As it turns out, losing her bag is the least of Eun-sung’s problems. Events unfold rapidly and in just two episodes we see Eun-sung losing her father, her home, and her money. Unknown to Eun-sung, her father’s successful company is now on the brink of bankruptcy. Her stepmother (Kim Mi-sook), used to flaunting her wealth in the company of other wealth-flaunting rich men’s wives, shows how much she loves her husband by demanding that he keep the company afloat with whatever means he can muster. Sell your heart if you must, she screams at him, but find the money! The desperate man takes her words to heart. Eun-sung’s younger brother is Eun-woo (Yeon Jun-suk), who’s autistic. The two are very close, and he’s a gifted pianist who has written a song specially for her. One of the first things that Eun-sung does upon returning home is to take Eun-woo with her to visit the grave of their late mother. But as far as Eun-woo is concerned, his little world is made up of his dad, his mom (the stepmother, not the mother who has passed away), Eun-sung and Seung-mi, his stepsister. Reconfigure his world and he falls apart. And indeed Eun-woo and Eun-sung’s world collapses. Begging the banks to no avail and managing only to secure a small loan from a friend, their father lies drunk in an alley and is robbed. 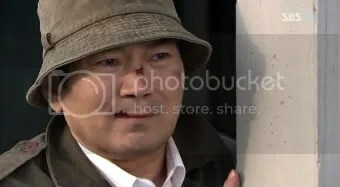 The robber is subsequently killed in a fire and is identified as Go Pyung-joong, Eun-sung’s dad, because he has the latter’s identity card, watch and ring on him. The news is broadcast on TV and that’s how his wife learns about his death. Eun-sung learns belatedly about her father’s passing and her grief is compounded by the absence of his body. (Han Hyo-joo wails like she’s being strangled; it’s hard to watch without cringing. Her crying does become more natural later, as does the rest of her acting.) When she insists that it might be a case of mistaken identity, the stepmother gives her the glare of death and Eun-sung stops protesting. But we know that Go Pyung-joong is very much alive. In fact, he even shows up (behind a pillar) at his own funeral. Why does he allow the charade to proceed? Simple reason: If he dies, his family gets a huge insurance payout. The money will allow his wife to maintain her privileged lifestyle and will pay for his children’s upkeep. Most importantly, Eun-woo will be able to continue receiving treatment for his autism. Instead of using the insurance money the way her husband intended, the stepmother wastes no time driving Eun-sung and Eun-woo out of the house. 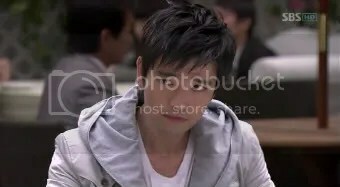 The stepmom gives Eun-sung a sum of money and even though the latter is bitter at being driven out, she takes the money for Eun-woo’s sake. The next few days are trying, even for a person used to hardship (which Eun-sung isn’t). Moving first to a hotel (which the fearful Eun-woo rejects) and then to a friend’s house (where she witnesses how even the kindest intentions can go awry, the friend and the friend’s mother beating Eun-woo for his outbursts and destructive behavior), she finally finds temporary refuge in a public sauna. There, she sees Eun-woo being beaten up (again!) and then discovers that her money has been taken (right under her nose, literally) while she was asleep. With no money, no home, and no one to care for Eun-woo so that she can look for a job, Eun-sung decides there’s only one avenue left. 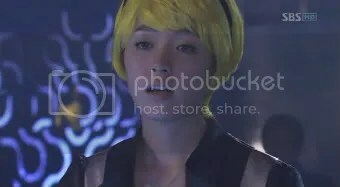 She and Eun-woo will go look for their parents… in the netherworld. What follows is rather cheesy and comical. 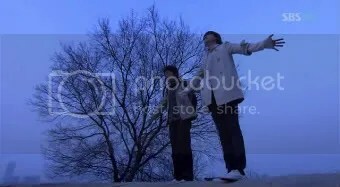 I know it’s supposed to be heartrending, these two orphans about to commit suicide, but the outstretched arms (Let’s fly, Eun-woo…) just seem so posed and staged, so dramatic. That almost-visit by the Grim Reaper galvanizes our Eun-sung and she seeks out another friend for help. Said friend must have had one trip too many to the plastic surgeon because Eun-sung does not recognize her. Still, the friend was once a recipient of Eun-sung’s father’s kindness and she immediately offers Eun-sung and Eun-woo a place to stay. Nothing fancy, just a tiny apartment that she shares with her boyfriend who works shifts. No overcrowding, phew. Not only that, the Good Samaritan friend helps Eun-sung find work as… a guinea pig for hair coloring experiments. Now employed as a waiter in a nightclub, Eun-sung’s ability to speak English (intelligibly, thank goodness!) is an advantage. She seems immersed and happy in her work, secure in the knowledge that Eun-woo is being watched by her friend’s boyfriend. But the good times don’t last. Who should swagger into the nightclub one day to ruin the merry atmosphere? RJ himself. He’s pissed that she stood him up on the day they were to meet and swap their bags. Of course RJ does not know her dad died that day. Still, does that give him the right to manhandle her? In his A Definitive Guide for Jerks, yes. But worse than Hwan’s rough handling is the frantic call that Eun-sung receives from her friend. Eun-woo is missing! I confess that I found Episode 1 boring. I started the drama bright-eyed, but after repeated yawning (and eye-rolling at the plot contrivances), I could barely stay awake. But the second episode surprised me; I didn’t feel bored, not at all. When I finished it, I couldn’t wait to go on to Episode 3… until I realized I hadn’t downloaded it. Dang! What kept me engaged was undoubtedly Eun-sung and Eun-woo’s story, from the moment they were driven out of the house to that cliffhanger ending, where Eun-woo has become united with Wicked Stepmother. Once again I’m gripped by fear for Eun-woo; I need to know what the witch is planning to do with him! 1) RJ’s hairdo must go. There’s enough hair on that head to stuff a pillow. Lopping some of it off might perchance free up space for good sense to seep in and thus make him more appealing? 2) Give Jun-se more scenes, c’mon! Can you stand seeing him so morose? Wow, thanks so much for your encouraging words. You made my day! I know the girl is from Spring Waltz but guys are complete unknowns to me. I was immediately struck by Bae Soo Bin’s beautiful sensitive eyes and continued watching becoz of him but it looks like he’s not going to get the girl. It looks like the pop idol is the main lead. I don’t find him good looking at all but he seems likeable enough. He’s kind of growing on me. I have to agree with the others that BSB’s character is very bland. What a waste of perfectly good looking man! Just discovered your blog today …really like your sense of humor. Keep prattling. I always like actors with soulful eyes, Tony Leung Chiu Wai or Jeon Kwang Ryeol for examples. And now, there’s a new one – Bae Soo Bin. I knew him since Jumong, but his character there was… weird!. But I’m watching Painter of the Wind now, and WOW, the king!!! He reminds me of my favourite Jeon Kwang Ryeol’s king in Jumong. Maybe I will take a look at Brilliant Legacy because of BSB’s sake (and… Han Hyo Joo, why not? Just like her beauty! ), although the drama seems not my cup of tea. BSB’s eyes are like pools, aren’t they? He’s got really nice lashes, too. What can I say, he’s just a dreamboat, LOL. I finished ep 5 and LSG is growing on me (and ripgal says “Yay, finally!” ^^). Somehow he just seems more palatable, even if he was really rough with Eun-sung when she was moving into the house the first time. I think it’s because I really do enjoy such setups: two people who hate each other forced to live in close proximity. It allows for all sorts of delicious bickering. (I like bickering if it’s done smartly; I just love sarcastic banter.) It’s the reason I enjoyed Attic Cat and, to a much lesser extent, Full House. *sigh* I know Hwan will win Eun-sung’s heart. Please just let him be worthy of her! Did you say Tony Leung Chiu Wai? *squeals* That guy is king of the smothering gazes. Love him! But sigh, I really disliked Lust, Caution. Don’t play anything in the buff again, Tony! Tony Leung was one of my first crushes in high school. Lust, Caution was TMI, hehe. But geezywheezy, the man is a versatile actor. Andy Lau? LOL. You are still watching BL? Would love it if you can hang on till at least E 9-10 when the angsty lovey parts start to kick in. Seung Gi hair is … gosh. HAHA. I agree, BSB is underutilized here – give him a few worthy lines please writer. The cast is so likeable (and good looking) that you can’t help but cheer them on. Hwan character is repulsive at first; let me know how you feel about him after E10…:D Pacing is good; though short breaks here and there for character development is better. Not enough depth in Hwan and Jun Se yet! Thanks for the link OK. Keep prattling. Oh, Andy Lau? Have not watched a lot of him, but a couple of favorites offhand are Infernal Affairs and Days of Being Wild. I like Leslie Cheung as well. Will check out ep 6 soon. What other dramas are you watching, btw? I normally don’t comment on blogs, but your recap was hilarious… commenting can’t be helped. OMG the hair comment, I still can’t stop laughing. But I think I’ve started to get use to it or completely ignored it, either way I’ve accepted it. I felt the same about episode one, I was bored. But I’ve seen so many kdramas that I figured eventually I’m going to do a total 180 and love the bad guy and hate the good guy. Sticking it out and after watching the most current episodes, I’m definitely turning. As much as I like JS, he just feels too much of a good guy, to perfect. No fun in that. And like most woman, not all, we tend to gravitate towards imperfection. Thanks for visiting the 1n2dfansubs blog. I was as equally surprised with your comment. Have always been a fan of your dead-on humour. This blog so needed to be shared. LOL. I’ve quit watching drama for a few years now. May check out Triple when it comes out. I love Lee Hana and her Peppermint. The 3 guys are not too bad either, LOL. I dunno if I would comment on javabeans’ blog. Wouldn’t want to get in the middle of that fantasy-dom. hahaha. It’s ashamed that not a lot of people acknowledged Kim Mi Sook’s performance as the Evil Mom in BL. I love how she is able to portray the mommy part from both sides of the spectrum. Seung Hee character is a 180 send off from the character she portrays in the movie Marathon/Running Boy. Both moms have sons who are mentally handicapped; yet their characters are worlds apart. Normally for dramas, what I do is to either finish the drama and write a review, or watch 2-3 episodes and write my first impressions. But while watching episodes 3-6 of BL, I did think about writing another post. I find the grandma and “evil” stepmom to be fascinating characters and I’m intrigued by what goes on in their heads. Yay, another fan of Mixed-up Investigative Agency! Did you watch it with our subs? 🙂 I love this drama to pieces. It was so zany and witty, but it also made me cry. I love Alone in Love as well; it was my second project with WITHS2. Omo, Kim Mi-sook was the mom in Marathon? No wonder she was vaguely familiar. She was amazing in that movie! Although she’s “evil” in BL, I’d rather watch her than Hwan’s shallow and flighty mom. I understand the pain of recapping a series. Been done it two times and my head hurts! LOL! But still enjoyable! Congrats with your oh, so popular BL post! Read your tweet that it is your most popular! haha! OMG thundie. hahaha. Was dropping by to let you know that 10/10 friends whom I’ve recommended to check out this entry loved it. And bam, your BL header pops up on my screen. LOL. Marathon was absolutely great, want to check out WB’s Mother next. Am I still following the drama? LOL, what do you think? I know, BL is so addictive, isn’t it? The last few episodes have been especially sweet. I really, really hope it’ll stay good all the way to the end. Please do NOT give us an ambiguous ending! You weren’t kidding, this BL episode 1-2 recap is quite possibly the funniest recap I’ve ever read (with the exception of a recap/re-enactment of Breaking Dawn someone did that Sevenses posted on her blog – I about died there). I can tell, too, that you noticed, inspite of whatever was lame, dorky, cliched, or silly about BL, that is was adorable and so sweet. I agree with your review wholeheartedly. I know I’m totally late to this comment thread, but I didn’t want to write about BL on the City Hall comment thread, which I can totally dominate if I don’t control myself. I watched BL, it was addicting, and when I do recommend it, it would be with some caveats, but no reservations. It was a sweet piece of fluff done right, and that is hard! I love your writing style, your blog rocks, and I’ll be a regular visitor from now on. Prattle on, Thundie! This isn’t the wackiest BL recap, methinks; I was just warming up my engine, lol. No, I’m not trying to lure you to read the rest! Hmm, I wouldn’t say BL is fluff. It’s a pretty meaningful drama for me. Not a great drama (and may not even make my Top 20), but a sincere and heartfelt drama that is sweet and uplifting. Nothing pretentious about it. Starts out cliched, but is able to iron out the kinks with each episode better than the one before it. If you read my Ep 14 recap, you’ll learn this is where I fell in love with the drama, which is exactly midway. So definitely not love at first or even second sight. Thanks for all the nice things you’re saying about the blog. *muah! * I glanced at a couple of comments on the Soompi CH thread and whoa, I’m not exactly the most popular person there, am I? Haha. Had to run for my life. Just posted my latest BL recap, so brain is fried. I’ll be back to respond to your CH comment and the others as soon as I can think clearly. Thanks!! made me rolled off my chair…. Thanks Thundie. I had been lurking on your blog and am enjoying your BL recaps immensely. I thought it too good not to share. So I printed every single page ( color even) and made it into a book and sent it to my mother who is residing in an assisted living home. She enjoyed it so much she even shared it with some residents and the caregivers and they equally enjoyed it. I warned them that it is only up to 23 episodes and if I get the rest I will send it to them. Thank you so much. I appreciate all the hardwork and dedication you put into it. I check your blog everyday and I’ve read your BL recaps 1-14 about 10 times and don’t get tired of it……Happy prattling!!! Wow. Look at all the comments! And I’m starting to wonder if it’s fun to play an evil stepmum. Anyone who thought the queen in Snow White was a b*tch should check this woman out on BL! Also, I noticed in your replies here that The Sons of Sol Pharmacy House sounds like something you would like, but you couldn’t find any subs. Of course your comment was awhile back, and I hope you’ve since managed to watch it. Was one of my favourites for the year. Started out hating/ disliking/ being indifferent to most characters but once past ep3, I was hooked! Really liked the character development there and to a lesser extent, RJ’s character growth at BL reminds me of the boys at Sons of Sol Pharmacy. It’s irrational, I know. Hwan’s grandma has hair that looks like his but I don’t hate her. You got me right there ! I mean the all Hwan’s hair thing ? What’s up with that ? I saw BL a long time ago (I didn’t manage to finish it) but I never noticed Hwan’s haircut… Anyway, I must have some issue with that too at some unconscious level because I almost die of laughing. Just started watching and remembered that you had recapped this. LOVED your recap! Hilarious and yet right on the mark as well! So excited about all the drama/recaps ahead of me! Whoohoo! Hey thundie, I am 2 yrs late but got only to see BL on TV 2months ago. Yr recap made me laughed so much. This is my 2nd Korean drama. First was Pink Lipstick and these 2 kdramas made me cried buckets and they were so addictive. Thks for all yr recap. What other recap you did for kdramas, I must have missed them. I like Kim Mi Sook’s portrayal of mother in BL… She is evil and good mom at the same time…. I really like all of her scene here. I can really see the pain, fear and vulnerability in her even though she shows to all her toughness and wickedness… She seems like a weak person trying to hide her weaknesses by bullying others… As the story unfolds, we can determine why she acted that way… She used to be weak when she was young, that’s why she resort to money for she believe this will give her power and strengths to outweigh her fear… fear of being poor…. and being ridiculed…. fear that her daughter would suffer the same fate as her….